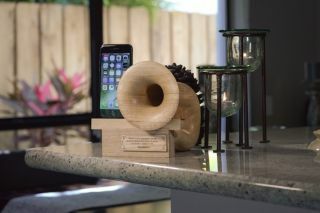 Now there's a horn speaker for your smartphone | What Hi-Fi? You can apparently boost the sound from your phone by up to 6dB. Also, did we mention it's made of wood? We have a lot of recommendations for the best wireless speakers or hi-fi speakers, but some people prefer something a little more analogue. Those people might be interested in Symphonica, a wooden horn, that's designed for phones, and which can apparently boost the sound from your phone speaker "by up to 6dB", while adding "warmth" to the sound. Looking like a miniature gramophone - and you thought the vinyl revival was retro - the Symphonica will work with your iPhone or Samsung device, including the soon-to-be-available Samsung Galaxy S8. Not just a pretty horn, it can also charge your phone thanks to the docking stand, and there's even a wooden Bluetooth remote. If you want to back the project, $85 (around £70) will get you the natural wood version, while $115 (around £90) will snag you the dark wood. Shipping is predicted for July 2017. Full details are here.